Successfully Added TC50 Vapor Storm Box Mod Kit - 50 Watt, Built-In Battery, Airflow Control, Adjustable Temp, 510 Thread, OLED Display to your Shopping Cart. The TC50 Vapor Storm Box Mod Kit is a sophisticated electronic cigarette that is perfect for anybody that wishes to leave behind those harmful and smelly tobacco products and replace them with a healthier and tastier alternative. This 50W box mod kit comes with all the components needed to build your very own high-end vaporizer. Crafted out of tough Zinc and Aluminum alloy parts, this e-cig features a durable and compact design that can be easily carried along within your bag or pocket without needing to worry about damaging your vaporizer. No matter where you’ll be heading next, with the Vapor Storm Box Mod Kit 50W at your side, you’ll always be able to enjoy a relaxing vape at any time of the day. 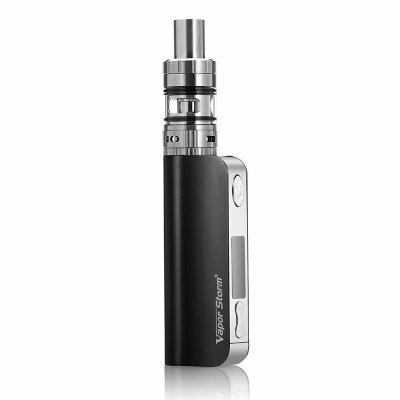 Coming with a 510 thread, this electronic cigarette is compatible with the vast majority of the tanks and atomizers out there – allowing you to replace its individual parts and customize your vaporizer to your exact personal liking. The TC50 box mod kit features a built-in battery that brings along plenty of power for you to enjoy numerous of tasteful vaping sessions without needing to worry about battery life. So whether you’re off for a day at the park, have to attend a business meeting, spent a relaxing afternoon at the beach, or simply enjoy your time at home – this powerful vaper will always provide you with the juice needed to get through the day. Thanks to its 50 Wattage of power output and 0.5-ohm resistance, this e-cig produces great taste and additionally lets you create exceptionally large vapor clouds that are sure to impress your friends and people standing by. Additionally, its manual airflow control lets you adjust the amount of vapor and taste created with each puff you take, allowing you to fully enjoy your upcoming vaping sessions in the way you love most. With its 1.9ml tank capacity, this vape mod kit lets you enjoy a sufficient amount of your favorite tasting e-liquid in one go. Simply attach your RTA, fill it up with the taste of your liking, and you’re all set to sit back, relax, and enjoy a great vape whenever you feel like it. On its 1-Inch OLED display, you will be able to constantly stay up to date about the currently enabled settings on your box mod kit. Displaying the temperature, ohm-resistance, Wattage and more – you can be assured that each and every puff is fully customized to meet your personal vaping demands. Perfect for beginning vapers and experienced e-cig lovers alike – the TC50 Vapor Storm Box Mod Kit is guaranteed to meet the likings of everybody out there. The TC50 Vapor Storm Box Mod Kit comes with a 12 months warranty, brought to you by the leader in electronic devices as well as wholesale electronic gadgets..